The total ARV of all prizes available in the Game is $95,910. The Sharpie Uncap The Possibilities Sweepstakes is offered only to legal residents of the 50 United States and the District of Columbia who are at least 18 years old or the age of majority in their jurisdiction of residence. 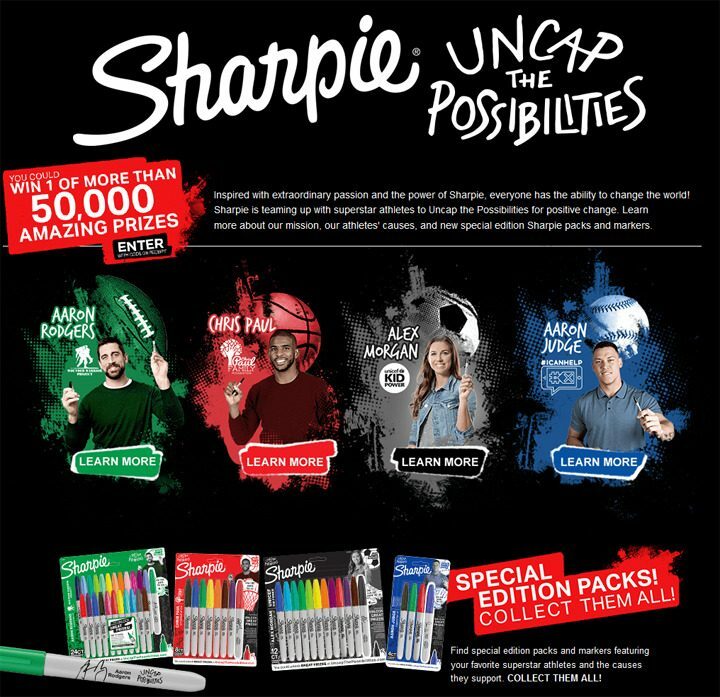 The Sharpie Uncap The Possibilities Sweepstakes ends on March 31 at 11:59:59 PM ET. No Purchase Necessary. Entrants may obtain an entry code to enter the Game using one (1) of the following four (4) methods. A. Purchase a Specially Marked Sharpie Product: Entrants may purchase a specially marked Sharpie product to obtain a unique Code printed under the cap, while supplies last. B. Upload A Sharpie Permanent Marker Purchase Receipt: An entrant may follow the instructions on the Website to upload an image of his/her original register receipt showing the purchase of a Sharpie Permanent Marker product. C. Without a Purchase Mail-In: To obtain a Code without making a purchase, an eligible entrant must legibly hand write his/her full first and last name, complete street address (no P.O. Boxes allowed), city, state, ZIP Code, age, and valid e-mail address on a 3 ½” x 5” postcard enclosed in a properly stamped envelope and mail it to: Sharpie Uncap The Possibilities Sweepstakes Code Request, P.O. Box 251328, West Bloomfield, MI 48325. D. Without a Purchase Online Code Request: An eligible Entrant must visit UncapThePossibilities.com/amoe and follow the onscreen instructions to obtain one (1) Code. Entrants can request up to one (1) Code per day via this method.